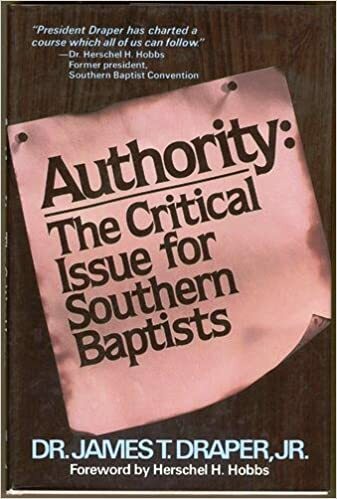 Having completed James T Draper’s Authority: The Critical Issue for Southern Baptists, available from the Amazon machine here. I feel compelled to suggest this book because if authority was a critical issue in 1984, it is even of greater importance now. The book is inexpensive and will be a great addition to your personal Christian-themed library. I would have never known how much some denominations have departed from this historically biblical view, had we not planted outside of the South. In Virginia and North Carolina we were in an echo chamber of believers upholding the authority of the Bible as inspired and without error. Leaving the Bible Belt has truly opened my eyes to the distance many professing believers have departed from orthodox beliefs and replaced them with man-centered philosophies and big tent theologies, without a scriptural basis to support their beliefs. Authority is a short book on a critical topic. One of the primary paths to attack Christianity is to whittle away at the foundation and one of the pillars of that foundation is the Old and New Testaments contained within the Bible. It does not take long to look at how quickly denominations go astray once they reject the authority of Scripture. This is why scriptural authority is not only a critical issue for Southern Baptists, it is a critical issue for all who believe Jesus is the Son of God, He died as a substitutionary atonement on our behalf, and that we must turn away from our past and seek forgiveness for our sins. Without the Bible, what basis does anyone use for their faith? Who becomes the decider of faith without the knowledge contained within the Bible? And there we find the fall of man in the Garden of Eden and the dragon and his fallen angels thrown down to the earth for their rejection of God’s authority. When we remove the authority of Scripture from the Christian faith, we lose our authority, our foundation, and cannot be properly equipped.